In 2003 the BBC initially were planning on bringing Doctor Who back as an animated series that would be shown online. The planned series boasted a very respectable cast with Richard E Grant as the Doctor, Sir Derek Jacobi as a reformed Master who travelled with the Doctor (whilst he was no longer evil he still wasn’t exactly nice!) and Sophie Okonedo as the Doctors companion. The first story titled the Scream of the Shalka was also written by Paul Cornell who had written many pieces of Doctor Who spin off material during the wilderness years and was a very acclaimed writer. This proposed animated series was for all intents and purposes supposed to be the official continuation of the original Doctor Who series, with Grant’s Doctor identifying himself as the 9th Doctor. Despite this however many fans reacted negatively to the announcement of the series as they felt that it was proof that Doctor Who would never return as a mainstream live action series, now that the BBC were seemingly content to bring it back as a niche cartoon. Still in a surprising turn of events by the time the first animated story was completed the BBC had already decided to bring Doctor Who back properly and thus any further animated stories were shelved with only Scream of the Shalka being completed. Since then Scream of the Shalka has been disregarded from canon. The official 9th Doctor is now Christopher Eccelston (well technically its John Hurt) and thus the Grant Doctor is now simply referred to as the Shalka Doctor and joins the likes of the Curse of Fatal Death Doctor, the Big Finish Unbound Doctors and the Cushing Doctor an unofficial Doctor. 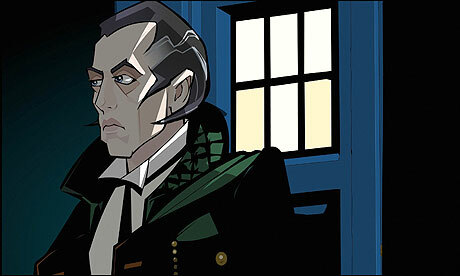 Personally however I loved the Shalka Doctor and I think he should be brought back into the tv series itself. 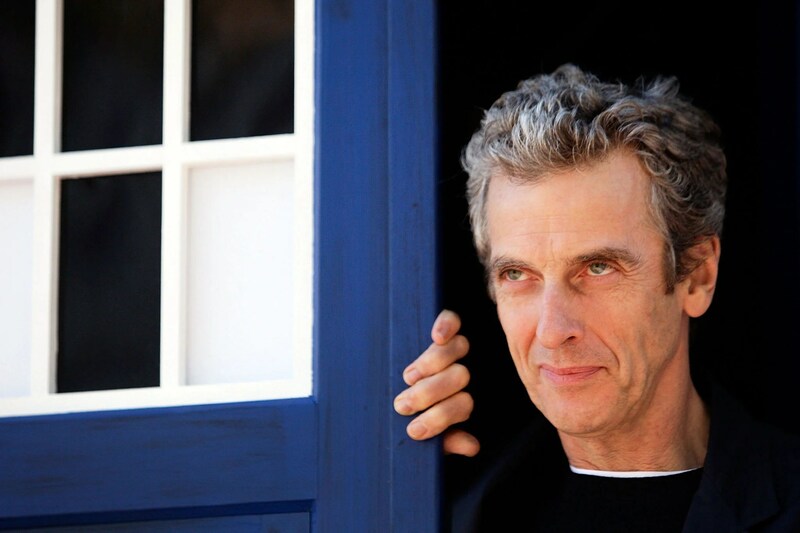 Don’t worry I am not saying that they should get rid of Peter Capaldi. Not only do I want Capaldi to stay, but I also don’t simply want Richard E Grant to play the mainstream Doctor I want him to play the Shalka Doctor. In this article I am going to run through a way that I think the Shalka Doctor can be brought into the series and why I think it would be a good idea. Let me know what you think about my ideas and also the Shalka Doctor in general. Obviously we couldn’t try and insert him into the main timeline, but I think you could have the Shalka Doctor appear as an alternate universe version of the Doctor. He would be an alternate version of the 9th Doctor specifically. 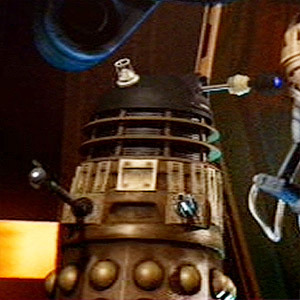 Perhaps in this reality the Doctor never met Cass and never became the War Doctor and later he and the revived Master were able to defeat the Daleks together before the war escalated to quite the same extent, though the 8th Doctor still met his end and regenerated into Richard E Grant instead of John Hurt as he never consumed the Sisterhood’s potion. Maybe the Daleks were not quite as powerful in this reality? The revived Master was then spared being put to death by the time lords provided he agree to travel with the Doctor and help him battle evil. The Master agrees and his consciousness is placed in an android body that resembles the current flesh and blood body he had and that can’t leave the TARDIS just in case he tries any more tricks. This of course then leads to the events of Scream of the Shalka. You’d have there be some big threat that would endanger all universes bringing the Doctors from two different universes together, or perhaps the Shalka Doctor would just fall into our universe by accident, through a wormhole or something. Richard E Grant and Sophie Okonedo and Sir Derek Jacobi would all reprise their roles as the characters from Scream of the Shalka. I think this would be an interesting new take on the multi Doctor story having the Doctor meet an alternate version of himself who he wasn’t sure he could trust completely. One who would be working alongside the Master, who had a completely different history to his. It would be interesting I think to see how the two Doctors compared their histories to each other, particularly during the time war. Maybe the Shalka Doctor would be appalled at the 8th Doctors decision to become a soldier and some of 12’s recent actions such as risking the universe in order to save just one person, Clara. I’d love to see Richard E Grant and Peter Capaldi play off of each other. They are both similar in some ways, both older, more respected thesp’s, both known for being quite cantankerous and grumpy, but obviously at the same time they have very different styles too. Capaldi is working class and Scottish, Grant is obviously posh and very proper and English. Even in terms of physical appearance, Grants hair is jet black and slicked back, whilst Capaldi’s is white and messy and all over the place. I can imagine the Shalka Doctor getting a bit frustrated with Capaldi playing his guitar and trying to smash it even! However at the same time I can see the two of them despite these initial differences finding a lot of common ground as they are both much older, more emotionally mature Doctors in contrast to say 10 and 11. They could end up having a bromance like 10 and 11 did by the end of their adventure together. Though what do you call a bromance with yourself? With the Shalka Doctor you wouldn’t run into that problem however as Grant never had an era. Hardly anyone has ever seen Scream of the Shalka and even for those who did it wouldn’t bring back any nostalgia as it was a time when Doctor Who seemed dead as a live action series for good. To most people it would simply be an alternative Doctor, and unlike the War Doctor it wouldn’t change the numbering or use up any regenerations either. You’d get the best out of the multi Doctor stories as you could give Capaldi a chance to play off of another actor playing the role, but without all of the baggage of fans of said Doctor saying “I wish they would come back permanently”. Added to that we would also give Sir Derek Jacobi a chance to play the Master again. Jacobi I thought was the best out of the three modern Masters. A case could be made for him ironically despite his brief tenure in the role being one of the best. At the same time however Jacobi appearing would not be in danger of conflicting with Michelle Gomez the current Master as even though he was in it before, this version of the Master would be a good guy and therefore not fulfilling the same role of the archfoe as Missy. Okay now please hear me out on this one. Personally I prefer to think of New Who and Classic Who as taking place in alternate universes to one another. Its not because I dislike New Who, but I simply feel that the two shows work better if they are in different universes to each other. I don’t like a story that goes on and on and on. Unlike the 11th Doctor I like endings. An ending is one of the most important parts of the story, it enables you to wrap up characters storyline’s and resolve and tie up any loose ends. Sadly in something that just goes on and on like Doctor Who I don’t feel that you can change the status quo too much. That might sound a bit odd to say that about Who, something that thrives on change, but still I’m talking about real fundamental changes to its core, rather than simply changing the lead actor. For instance you could never kill off say the Master, the Doctors archenemy and bring his story to an end. Someone could come up with the best story ever to finish his or her storyline, but then some time later it will be completely undone and the Master will come back as a villain again, simply because the Master is such an iconic enemy he can never be finished off. People are always going to demand his return and fans who grow up to become writers who work on the show will want to bring him back. Thrice the character has been finished off in a way that really rounded his story off perfectly. 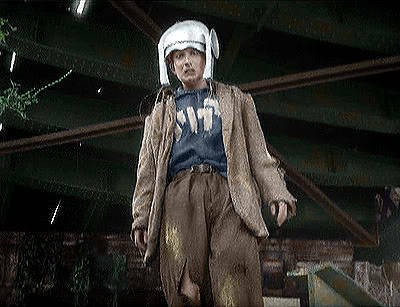 In Planet of Fire he was burnt to a crisp with no hope of return, in the tv movie he was sucked into the eye of harmony and in The End of Time he redeemed himself whilst sacrificing himself to save the Doctor. In all three cases however he had to come back like nothing had happened. You could even argue that the return of Gallifrey was like that. Personally I loved Gallifrey returning, but I can see how to people who preferred the Doctor being the last of his kind it would seem like a slap in the face. Now if you were to establish that New Who and Classic Who were in different universes then you could finish both of their stories. I’m not saying you’d instantly finish New Who of course, but this would allow it when the time comes to maybe have a resolution and also be able to make long lasting changes. This is why I prefer DC to Marvel. Marvel follows the one big story and thus I feel isn’t able to make as many long lasting changes as DC at least used to be able to using its multiverse format. In Marvel similarly they can kill off major characters like say the Green Goblin Spider-Man’s archenemy in The Night Gwen Stacy Died, which was the perfect end to the character, but then someone will bring him back later because the Goblin is too big a character to stay dead. Also look at how many times Captain America has died and come back. DC comics meanwhile followed a different format where they made out that all of their stories from the 30’s to the 50’s took place in a different universe to the stories from the 60’s to the 80’s. This wasn’t a simple reboot where they ignore everything that came before. They had the 60’s-80’s versions of characters like Superman and Wonder Woman and the Flash cross over into the other universe where the 30’s-50’s versions lived and met them. The Flash of the 30’s-50’s Jay Garrick meets the Flash of the 60’s-80’s Barry Allen, when the later accidently, whilst experimenting with his super speed, crosses over into Jay Garrick’s earth. The 30’s-50’s earth was christened earth 2 whilst the 60’s-80’s earth was christened earth 1. The multiverse format for DC not only allowed it to do cool crossovers like the one above but it also I feel enabled them to bring the original versions of their characters to a close. The Earth 2 Batman for instance married Catwoman, had a child with her named Helena (who later became the hero known as the Huntress after Catwoman’s death) and eventually died in battle with an evil sorcerer. This was not just any old Batman remember, this was the one who had starred in every comic from the 30’s to the 50’s. Yet DC were able to kill him and keep him dead, unlike Doctor Who with the Master or Marvel with Captain America as the multiverse format allowed them to still do stories with the earth one Batman who at the same time wasn’t bound by 30 years of continuity and could be a different character in some ways. Also unlike a standard reboot the 30’s-50’s Batman was not simply forgotten about. The Huntress his crime fighting daughter not only starred in her own series but regularly crossed over into Earth 1 and met and worked with an alternate version of her now deceased father. To me the DC multiverse format would be good for Doctor Who. This story would establish that Classic Who took place in a different universe to the revival. The revival universe had a similar history yes, explaining the presence of the classic era Doctors in the 50th, but ultimately its a different universe and the Shalka Doctor is the 9th incarnation of the classic era Doctors. Now I realize that this would piss so many fans off more so than anything else in the shows 50 year history, the war Doctor, gender bending timelords, the half human bit etc so I think there should be a compromise. The story that features the Shalka Doctor wouldn’t outright say that the Shalka Doctor is the classic era Doctor. Well to be honest he couldn’t unless he actually said “By the way I’m the Doctor you saw from 1963-1989 and in 1996, but NOT the one from 2005-present”. You’d simply establish that he had the same history as the version in New Who. His first 8 incarnations would be Hartnell, Troughton, Pertwee, Baker, Davison, Baker, McCoy and McGann too. Thus it would be left up to the viewer to decide if the Shalka Doctor was the one from the Classic Who universe or the new Who Doctor was. Nothing in the show would suggest otherwise. I think that would be the perfect compromise as it would allow classic who fans who dislike the changes new who has made to classic who canon to view the new series as not being connected to it. Who knows some people might even appreciate it more that way. It can’t be denied that New Who doesn’t mesh with Classic Who a lot of the time. Yes there were continuity blips in classic who, but its not quite the same as new who’s changes. Take for instance the Great Intelligence in New Who. His story doesn’t mesh with the classic who intelligence. The Classic Who Intelligence is an alien from another universe that enters our reality through the monks in Tibet’s meditation which acts as a psychic bridge into this universe. It then spends 200 years in Tibet until the 1930’s building a robot army to take over the world. It never has a true form its just a voice in the air. In New Who the Intelligence is created by Doctor Simeon at a much later date in Victorian England and its only able to survive outside of its case at the end of the story. Also it assumes the form of Walter Simeon which it keeps until the end of its life. As you can see this is completely at odds with Old Who. In one it is an alien that enters our reality in the early 18th century in another it is created from a human in the mid 19th century. In one it is in Tibet, in another it is in Victorian England. In one it always used Walter Simeon as an avatar, in another it is just a voice. Also its character is completely different in both cases. In old Who it is a cold logical being that seeks knowledge and is also somewhat cowardly. When the Doctor asks it if it wants revenge it says the revenge is a petty human emotion and shrieks in panic that the Doctor wants to destroy it when he makes a plan against it. In New Who however the creature is driven by revenge. It seeks to destroy the Doctor above all else, and far from being cowardly it kills itself just to torture and kill the Doctor. In many ways the two are polar opposites to each other. The Master is similarly a totally different character in New Who. In Old Who he was a villain who sought power and started out as more of a sociopath who viewed life as expendable. We saw him go more insane due to a variety of reasons over the course of classic who, but he didn’t start out as a maniac. In New Who however it is established that he was insane since the beginning due to the constant drumming in his head. This not only tosses about 16 years worth of character development for the original Master out of the window, but it also doesn’t make sense as why didn’t any previous Masters or Doctors mention the drums the thing that tormented the Master for his whole life? Also it changes the Doctors entire relationship with him. In old Who because the Master was not a raving lunatic the Doctor held him accountable for his actions and tried to kill him, in fact in the Mind of Evil he goes out of his way to kill him even when he is fleeing. He also views him as a monster and despises him. In New Who however the Doctor believes that the Master is a good person underneath and that he is not accountable for his actions such as when he says “you don’t want to do this” or when he says that he is not here to kill him but help him. Why did the Doctor never have this attitude for hundreds of years? Why did he never try and get through to him in that amount of time? Also Davros’s story is different in New Who. In The Witch’s Familiar it is established that he programmed a tiny bit of mercy into the Daleks DNA. This completely contradicts the whole point of Genesis of the Daleks where we see that he removed all concept of mercy and pity from them. If you take the Witch’s Familiar as canon to Genesis then the ending where the Dalek says “PITY I HAVE NO UNDERSTANDING OF THE WORD” can’t be taken literally. Finally even the Doctor himself, his reason for running away was because of a prophecy about the Daleks and the Time Lords. To start with that changes the whole point of the character. The Doctor was meant to be someone who was actually at his core quite straightforward. He was bored and he wanted a nice life so he fled and went exploring the universe because he wanted to. That’s a big part of the characters appeal that he just does what he wants. Now however he didn’t want to leave Gallifrey, he was just scared. Also why did he not recognize the Daleks in the first Dalek story if he fled because of a prophecy about them? Why also did he never mention or investigate this prophecy for 50 years? This isn’t just a little blip like the UNIT dating controversy. This is entire characters history’s characterisations and motivations changing and becoming completely contradictory to one another. Thus for me its better if New Who is a different universe and the Shalka Doctor would give me that option, yet at the same time it would allow those who want Who to all be one story to still view it that way. We could explore alternate universe versions of other classic Who characters through the Shalka Doctor. See the other roads our favourite characters might have gone down. Or if the Shalka Doctors universe was the Classic era Doctors universe we could have the classic era versions of old characters return. Again you wouldn’t say that they were specifically the classic era versions of those characters but you would just portray them in such a way that they could be seen like that. You’d have Davros for instance in his old Emperor casing from Remembrance of the Daleks, and you’d have Terry Molloy who played Davros in Classic Who play the role again, opposite Julian Bleach who would play the new who Davros still in his black Dalek base. After all it never was explained how he went back to looking like he normally does when he had removed the last vestige of his human form.in Remembrance. Maybe he didn’t if The Stolen Earth/ Journeys End and The Magicians Apprentice/The Witch’s Familiar took place in a different universe to Remembrance? Or to those who wanted them to take place in the same universe well maybe this is just a Davros who stayed like that. 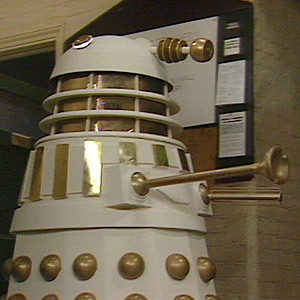 Similarly we could have retro Classic Daleks. Specifically the ones from Remembrance of the Daleks as that was the last appearance of the Daleks from classic who opposite the Daleks from the revival. I think you could do a very interesting story involving the two races of Daleks. I’d imagine that the classic era Daleks would find a way to travel to the other universe. As they are behind the New Who Daleks in terms of technology maybe this would be the first time they explored another universe. Naturally when they found the New Who Daleks they would wish to exterminate them as after all nothing pisses a Dalek off more than an impure Dalek. The two races would war with one another for a long while until they decided to call a truce. The Daleks would do this simply because they would realize that by pulling their resources together they could destroy every universe after which they who would be the only survivors on a ship like the crucible would fight it out to see who was the only true Dalek race. Whilst the New Who Daleks did manage to nearly destroy every universe on their own in Journey’s End you could have it that they have fallen on hard times after the Twelfth Doctor sabotaged their city in the season 9 opener and thus they needed the Classic era Daleks resources. This would also explain how the Classic era Daleks could take the New Who Daleks in a war as they would have greater numbers. Naturally as both Daleks were building a weapon that could destroy all universes, both the Shalka Doctor and the New Who Doctors would be forced to travel into the Shalka reality where both Daleks were working together and be forced to team up to stop them. We could see how both Davros’s work together and give Bleach and Molloy a chance to play off of each other. Molloy’s Davros is the emperor of his race of Daleks, whilst Bleach’s Davros is basically a pet of his Daleks locked up in a cage somewhere. You could have Molloy’s Davros think that he was superior as he was in command of his race of Daleks, whilst Bleach’s Davros would think that he was superior as his Daleks were no longer completely dependent on him and had in many ways triumphed over the time lords who were now in hiding from them. It would also be interesting to see the original Daleks work with the new ones. The original Daleks would obviously be more primitive, but they would also perhaps be more ruthless. Unlike the new Daleks they would have literally no concept of mercy (perhaps that’s where the timeline’s diverged in the new and old Who universes. In the New Who universe the 12th Doctor instilled that tiny bit of mercy in Davros who in turn placed it into the Daleks which leads to them sparing him at the end of Genesis. They don’t kill him but they keep him around like they later do as a pet and use him for his scientific genius. 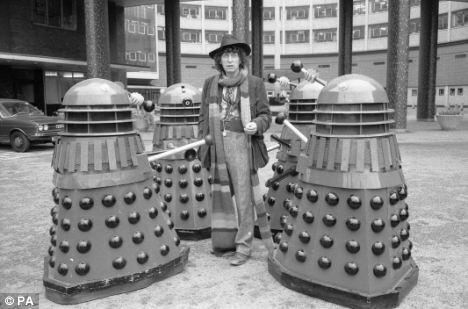 As a result of this these Daleks progressed a lot faster than the Classic era Daleks. 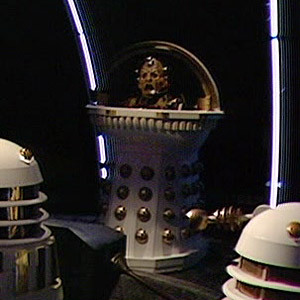 Not only were they able to make use of Davros’s scientific genius unlike the original’s who had to start from scratch after 4 sabotaged them, but these Daleks were also never divided by a civil war that Davros later instigated in Classic Who in Remembrance of the Daleks which not only split the race down the middle, but led to the destruction of their entire home planet. Here Davros was their prisoner and thus they remained a united race building a far greater empire. 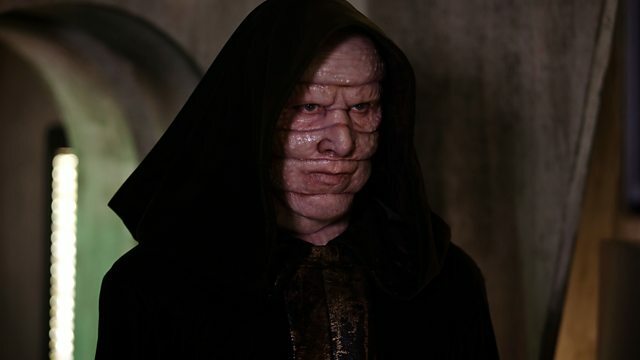 Though obviously at some point Davros managed to escape in the New Who timeline and tried his scheme on Necros which is why we saw the clips of Colin with Davros in The Magician’s Apprentice. However his plan failed and he was captured and imprisoned, with his Necrosian Daleks being destroyed. The events of Resurrection and Remembrance of the Daleks did not happen in this reality. As for why we heard Davison threatening Davros and McCoy mocking him well perhaps Davison threatened him at another point and McCoy used that taunt at another point. Genesis still happened in this universe, but again its ending was different as rather than memorably zap Davros instead they just took him prisoner. The events of other Dalek stories may have gone differently as a result of this. For instance the first, second and third Doctors would have most likely have met Davros. Perhaps Davros was the commander of the Dalek invasion of earth and had his first battle with the first Doctor in that adventure. Thus with all this in mind the Classic era Daleks were naturally far behind the new who Daleks. Though they still launch a war against the Time Lords and gave them a run for their money, ultimately it was not as devastating a conflict as the time war in new who’s reality which is why the Doctor never needed to become the war Doctor and ultimately why the Doctor and the Master were able to best the Daleks. Thus the war saw neither the Daleks or the time lords wiped out, but the Daleks were set back as was Gallifrey with the war still seeing billions of casualties. 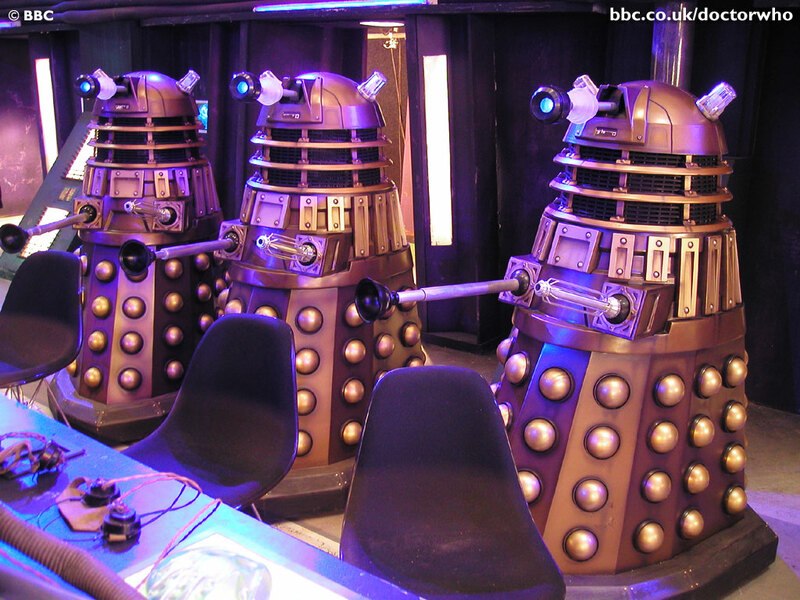 Aside from seeing the two different Dalek races we could also see their servants from classic who and new who meet. 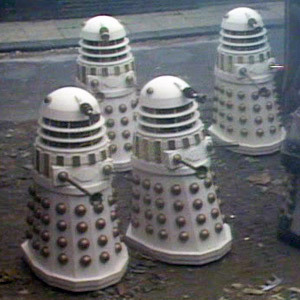 The Classic era Daleks would have Robomen, Ogrons, Varga plants and Dalek troopers. The New Who Daleks would have Dalek puppets, Colony Sarff’s and Pig men. Granted all of these guys couldn’t have a major role or else it would get to cluttered. I think you’d have to give some of them cameos on the bridge of the Dalek ships and also perhaps have a flashback sequence of when the two Dalek races first met and began warring with each other. That’d be a brilliant sequence seeing millions of Remembrance and Bling Daleks blast each other in the sky whilst millions of Colony Sarfs wrap themselves around Robomen, and Ogrons blast Dalek puppets and Pig men with their ray guns on the planet’s surface. .
You could also have an alternate version of Kate Stewart and have her be played by Beverly Cressman who originated the role in Downtime a video spin off in the 90’s which featured Nicholas Courtney. Beverly Cressman the original Kate Lethbridge Stewart in Downtime. I think it would be great to see Beverly return to the role of Kate. In contrast to Jemma Redgrave her version of the character was more compassionate and less willing to sacrifice innocent lives for the greater good. She also surprisingly had quite a cold relationship with her father. Prior to the events of Downtime the two hadn’t seen each other in years and the Brig wasn’t even aware that he was a grandfather. Compare this with Redgrave’s Kate who practically worships him. We could also have the character of Major Kennet who appeared in Scream of the Shalka and was voiced by Jim Norton an Irish actor best known for playing Bishop Brennan in Father Ted appear alongside Kate as well. As for how you could work UNIT into the story well I suppose you could have the Daleks arrive on the earth perhaps to use the Rift as a weapon. After all it could exist in this reality too. Perhaps they had found a way to make it become so unstable it would rip apart all of creation itself, whilst they would survive in the nothingness between universes? Thus their base of operations is on earth, albeit in secret and UNIT (who in this reality control the Rift as there is no Torchwood.) and the two Doctors have to team up to save all universes from the Daleks. Personally I think that would be an excellent story. It would have Peter Capaldi and Richard E Grant playing off of one another, Terry Molloy and Julian Bleach two different Davros’s, the Classic era white and gold imperial Daleks meeting the Bling Daleks from New Who, we could see the original Kate Stewart, Sir Derek Jacobi as the Master and Bishop Len Brennan! 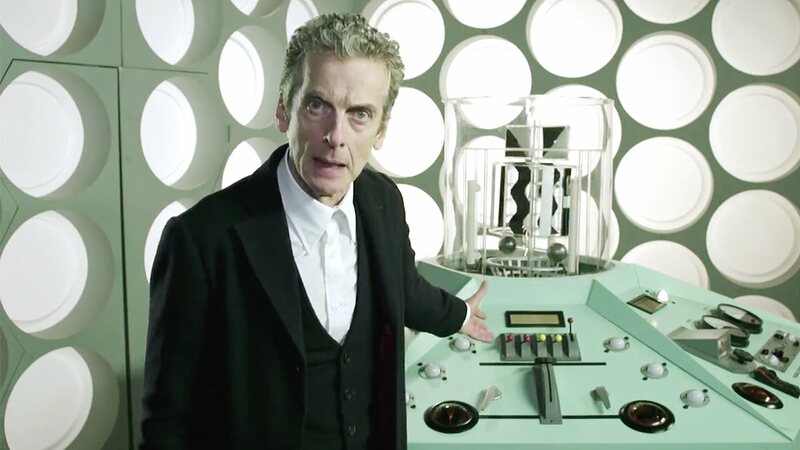 Hell we could even have the retro TARDIS back as the Shalka Doctors TARDIS would look like that on the inside. And of course like I said this story would leave it open to viewers to decide what New Who’s relationship to its predecessor was. If you wanted you could say that Classic Who took place in a separate universe to the revival and the Shalka Doctors universe is the classic Doctors universe with the Shalka Doctor being the Classic Doctor then that’s fine. The classic Daleks, Davros, Kate, TARDIS interior would all back you up. Or if you wanted you could see the Shalka Doctor as being just an alternate universe version of the original then that’s fine, this could just be a universe whose history split off from the main one and the retro Daleks who are merely more primitive. Personally I hope the producers of Doctor Who capitalize on the Shalka Doctor and we get a story like this. Obviously I’d trust the writers of New Who to come up with a better story idea that brings the two Doctors together. Still I’d like to see a story that uses the premise of the two Doctors from different universes and has both universes Daleks meet up. I think this story could open up lots of interesting story ideas as it would give the writers a whole new Doctor Who universe to play with. You could even have the Doctor meet his alternate self once every Doctor, with the alternate Doctor having regenerated and changed companions since we last saw him too. A story featuring the two Doctors battling the Master from New Who’s universe for instance would be another interesting story as the Master in the Shalka Doctor’s universe is reformed and a companion of the Doctor who has helped him save the day. Thus we could have both Masters meet each other and both be appalled at the way their counterparts have gone. Missy, or whoever was playing the Master at this point as this would be the Doctor after Capaldi so it all depends on if Chibnall wants to use Gomez? Possibly due to the warm reception to her performance? Maybe not however as he might just want a clean slate. Anyway Missy would be appalled at her goody two shoes counterpart whilst the Jacobi Master would loathe the degenerate sociopath he had become in this reality. A monster that butchers young people for no reason, the Jacobi Master would be even more grateful to the Doctor for saving him from damnation. I’d love to see a scene where the Jacobi Master sees Missy killing someone completely defenceless and innocent for literally no reason at all like Osgood and be utterly horrified at his counterpart being capable of such senseless cruelty and really try and destroy her. This could contrast the senseless cruelty of the New Who Masters like Simm and Gomez with the more logical, ruthlessness of the Classic era incarnations. the Ainley Master for instance, the murder of Teegan Jovanka’s Auntie aside I can’t ever imagine doing anything like murder Osgood or Chantho for no reason. Even he had his limits as seen when he is genuinely horrified at what happens to Luke or in Survival when he even says he’d rather die than just be a savage animal killing for fun. So with this in mind if the Shalka Master is the original Classic era Master it would be interesting for him to see Missy and realize that is what he could have been if he had let the Cheetah virus consume him. The possibility of the alternate Doctor would also give actors who might not be able to play the Doctor a chance to do so. Actors whose schedule might be too busy or would be too expensive for a full series could play the role for say two episodes that feature the alternate Doctor working alongside the New Who Doctor. Hmmm, what a fun idea. You’ve obviously put a lot of thought into this! Funnily enough, I had the idea of letting the Shalka Doctor into the canon too, only my idea was that S-Doctor and S-Master were actually not the real Doctor and Master, rather they were decoys created by the Time Lords during the Time War. They were meant to distract the Daleks by leading them on a wild goose chase around the universe, while the real Doctor helped out with the war. For some reason, I personally prefer the idea of Classic and NuWho being in the same universe, but I can see how the interpretation of separate universes clearing things up. Hello. I really like this idea – I too felt there was quite a discrepancy between New and Classic Who that couldn’t just be handwaved. So making them as connected but divergent timelines and universes make absolute sense.👍 (Another divergent universe originating from the 8th Doctor is Faction Paradox and the neverending War with ‘the Enemy’!). By the way, what had happened to your other articles/posts dealing with the ‘New Who – Classic Who are different universes’? You featured crossovers with Blake’s 7, Quatermass, Buffy the Vampire Slayer and even the underrated Prince of Darkness (John Carpenter), and so many others, along with a timeline of how these all fit together, but as per New and Classic Who respectively.😎 I really miss those! Many thanks. Hey man glad you liked the theory. Don’t worry I will be doing an updated version of the old article soon. Just go so much in the pipeline right now. Stay tuned though. Hi there, don’t know if you’re still interested, but here is the first part of The History of N-Space. Part 2 will be out by the end of the month. I expanded on Romana’s story, and I hope you like my casting choices for Romana and the Doctor. I also might be doing a series based on the adventures of these Doctors and Romana’s soon. Got a lot in the pipeline first, but still would love to hear your opinion on this.